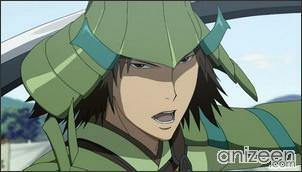 Meet Yukimura, a member of Shingen’s army, and Masamune. Both of their armies are headed to war, and they quickly commence fighting, in the end, the result is a draw. Some time later, Masamune makes his appearance, mounted upon his mighty dark steed, equipped with a handlebar and two exhausts and proceeds to obliterate part of an army. 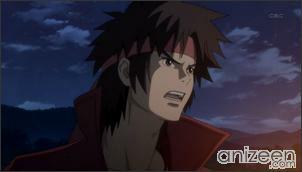 But Yukimura soon shows up to settle the score, what follows is a huge fight. In the atmospheric encounter, the laws of nature are bent while reality is slowly fading away. 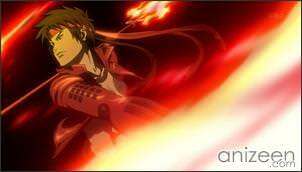 The primal force with which Masamune and Yukimura are fighting transforms all matter surrounding our heroes into testosterone. Yes, indeed, testosterone. But the transformation into testosterone is not everything. As the two heroes are invoking the energies of the cosmic chaos, the masculinity overflows and their particles begin to break, you could say this is a macho anime. The audience is not supposed to take this terribly seriously. You might guess that fans of the game will like the series, and if you want some flashy samurai action with somewhat odd humor, you may well like it too. 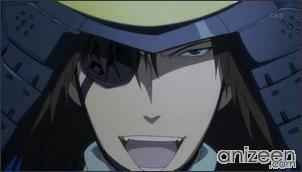 Date Masamune is the ruler of the Date clan known as the Dokuganryuu. He is an ambitious warlord whose mannerism is very close to Dante of Devil May Cry’s fame. Usually wields a single katana, but he can store and fight with six swords at once (three in each hand, held between the fingers). 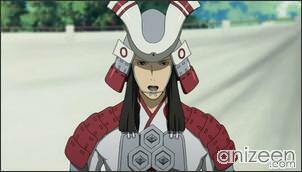 He is also depicted in a rivalry with Sanada Yukimura. 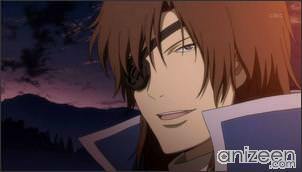 Sanada Yukimura is one of the most distinguished warriors in the Sengoku Era who opposes Tokugawa Ieyasu to the end. 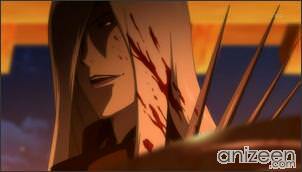 Wields two juumonji-yari, very hot-blooded and is fanatically loyal to Takeda Shingen. 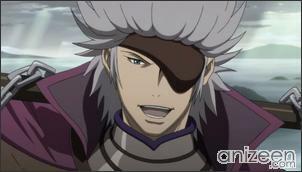 Also one of the main characters in Sengoku Basara. Is often depicted in a rivalry with Masamune and is a common “punching bag” for Takeda’s unnecessary brawls, though he always looks at it as a test of strength. Sarutobi Sasuke is a ninja in the service of Takeda clan, or to be exact the Sanada clan, counted as one of the Sanada Ten Braves. He is sneaky, cunning and laid back but has a big sense of responsibility when necessary. 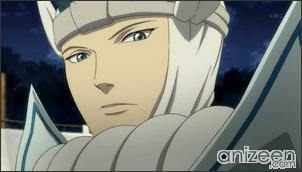 Is shown to have a friendly rivalry with the Uesugi army’s ninja Kasuga, though the latter doesn’t look at it that way. Wields two giant shuriken attached with invisible razorwire. He also summons a crow familiar to glide down. 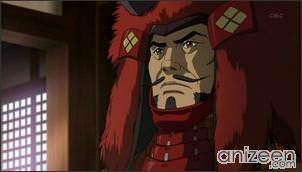 Takeda Shingen is the leader of the Takeda clan, famous for its cavalry. Has a large, imposing frame and a brilliant mind as well. Wields a giant axe. Often starts large and unnecessary brawls with Yukimura, sometimes for no reason, usually by wrestling or exchanging names while punching each other at the face. 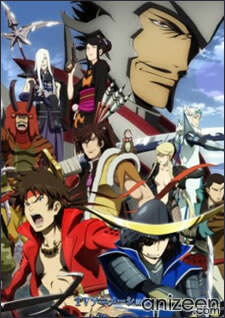 Sengoku Basara (戦国BASARA), is a video game for PlayStation 2 first published on July 21, 2005 by Capcom. A three-volumed manga adaption, Devil Kings Basara (known in Japan as Sengoku Basara Ranse Ranbu), created by Shimotsuki Kairi. An anime adaptation had recently been announced. 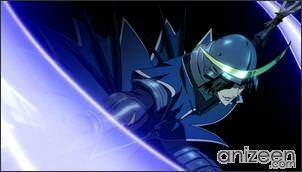 It will air on April 1, 2009 and is being produced by Production I.G. Oh dam, Date is the main character? That guy is so arrogant in the game Orochi Warriors 2, I don’t think I like to see him as a leading role. >.> But I will be checking this series out anyways.